Coalition Technologies hires nothing but the best and brightest minds in their respective fields. Every member of our team brings something to the table that is valuable and necessary. Gabby and Sanjeev are two perfect of examples the amazing employees we have in our ranks. Their dedicated efforts to making Coalition a better company are why we want to recognize them as December’s employees of the month. Gabby began working for Coalition Technologies in March of 2015 as a Remote Recruiter. In her role, she is responsible for recruiting, screening, and interviewing the potential candidates for open positions at Coalition. She works tirelessly to add people to our team that are hard-working, intelligent, and eager to grow with our company. Gabby has been a crucial part of our team, especially in recent months. We have seen the addition of 9 recruiters and she happily took on the responsibility of training all of them. In between training and recruiting new team members, Gabby also supports Ivona, our Head of Human Resources, with administrative tasks. When asked about her job at Coalition, Gabby says she loves what she does and seeing new hires become great assets to the company. She also loves the team environment and how well everyone works together to reach common goals. In her spare time, Gabby enjoys baking, cooking, and painting/drawing. Spending time with her friends and family and watching them enjoy her culinary creations is one of her favorite ways to spend her time off. In March of 2015, Sanjeev began working for Coalition Technologies as a SEO Analyst Lead. His work on many of our clients has made a huge impact. From helping our SEO Analysts grow in their roles within our company to making changes to client websites that improve their website traffic, Sanjeev’s dedication to his job shows in everything that he does. Working in SEO is not an easy task. The work that Sanjeev takes on daily is the difference between keeping a client and losing them. He understands the importance of improving our client’s web traffic and works hard to implement changes he knows will help. We have clients that have stayed with us for over a year, thanks to the increases they have seen after Sanjeev and his team help to optimize their website. Away from work, Sanjeev loves to paraglide and learn about Hindu mythology. He also enjoys time with his family. 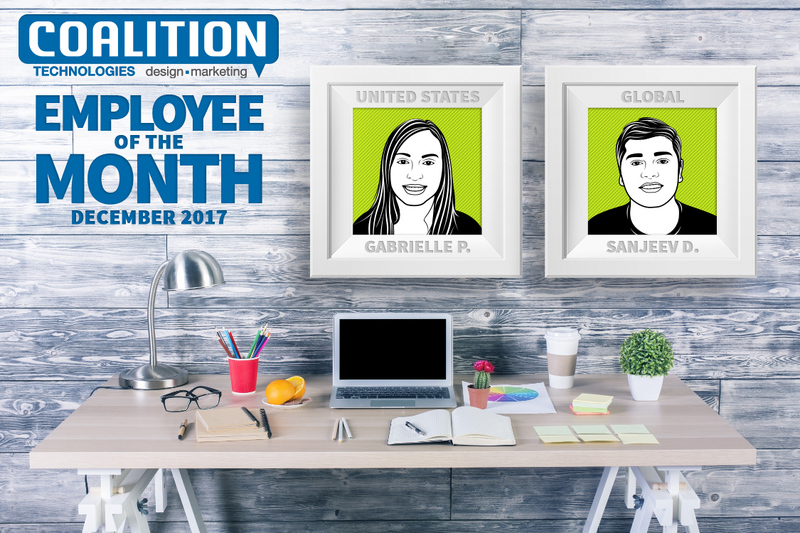 When interviewed, Sanjeev stated that his favorite moment at Coalition Technologies has been receiving the honor of employee of the month. You deserve it. Thank you for all that you do! Coalition Technologies is full of amazing team members that constantly keep our company moving forward. Our team is full of bright individuals who support one another and do everything they can to help our clients. 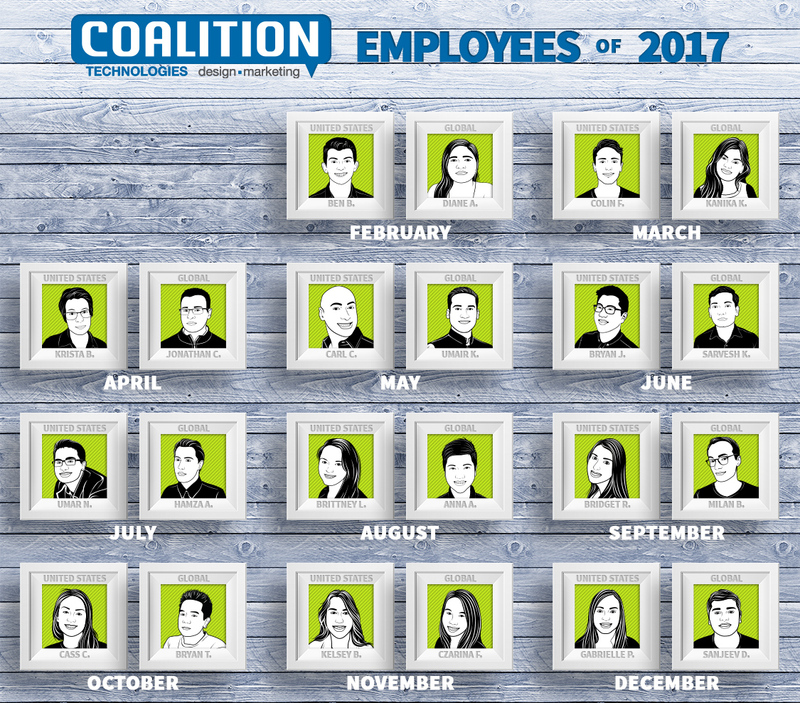 Keep your eyes peeled for next month’s employees of the month and learn more about the awesome people working behind the scenes here at Coalition!